Kisin and Pappas (Publ Math Inst Hautes Études Sci, 2018) constructed integral models of Hodge-type Shimura varieties with parahoric level structure at \(p>2\), such that the formal neighbourhood of a mod p point can be interpreted as a deformation space of p-divisible group with some Tate cycles (generalising Faltings’ construction). In this paper, we study the central leaf and the closed Newton stratum in the formal neighbourhoods of mod p points of Kisin–Pappas integral models with parahoric level structure; namely, we obtain the dimension of central leaves and the almost product structure of Newton strata. 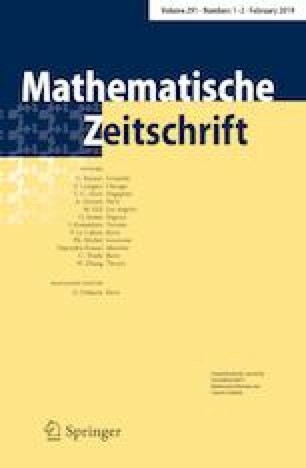 In the case of hyperspecial level structure (i.e., in the good reduction case), our main results were already obtained by Hamacher (Math Z 287(3–4):1255–1277, 2017), and we show that the result of this paper holds for ramified groups as well. The author thanks Paul Hamacher for many helpful discussions, and Julien Hauseux for his help with group theory used in the proof of Proposition 3.1.4. The author would also like to thank the anonymous referee whose comments were greatly helpful. This work was supported by the EPSRC (Engineering and Physical Sciences Research Council) in the form of EP/L025302/1.